Free clean bedline and towel. Worthy quality. Good location with long opening hour's supermarket and restaurant around. - Very friendly staff. 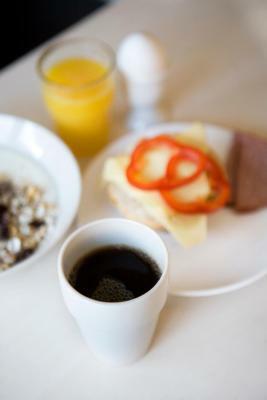 - Good arrangement on parking - Room itself was clean - Nice location - Breakfast was well worth the price! room was clean and comfi, reception desk was professional and very welcome. Nice and cosy rooms, tv in the room and not much noise coming from other rooms or corridor. 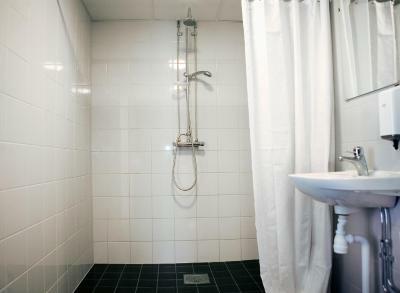 Good location just outside center near Haga, friendly staff, nice communal kitchen. I booked this through the bookings website. 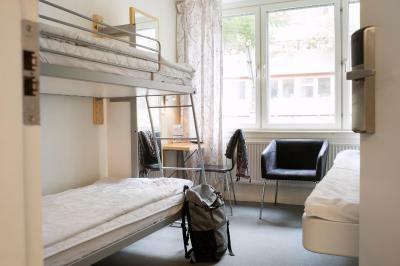 The photo online is absolutely not a representation of the room I stayed in. I will not be staying here again. 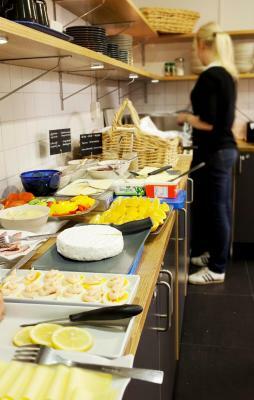 The hostel is in a great location, right in Linnegatan which has lots of great places to eat and go out (it's about a 5 minute walk to the Langgatan streets, which we loved!) In the other direction is Slottsskogen park which is beautiful and a great place to wander/bike around. It's right near a bunch of public transit so it's easy to get around. Also, it has good kitchen facilities and the building is quiet at night. You won't find many private hotel rooms as affordable as this in Sweden - especially in a city like Gothenburg. Location is great - very quiet, just outside the center, and with very frequent public transport links. There is a well-equipped and clean guest kitchen, and the shared bathrooms were very clean - both in the evening and in the morning. Room was small, but had everything you needed if all you want to do is sleep there. 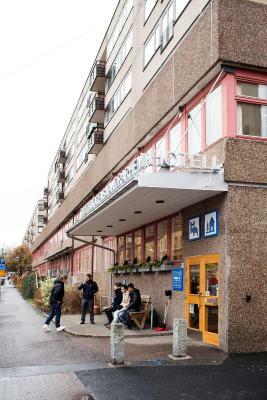 Slottsskogen Hostel is in the Linnéstaden district of central Gothenburg. It offers free WiFi and rooms with a TV, seating area and shared bathroom facilities. Bed linen is also included in each room. 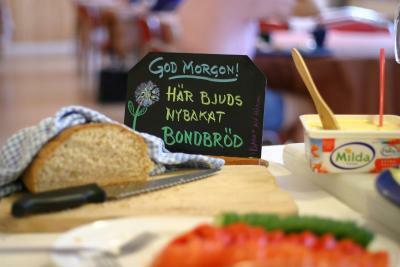 Guests at Hostel Slottsskogen can start their day with a rich buffet breakfast with organic options. Light meals and refreshments are offered at the on-site café. 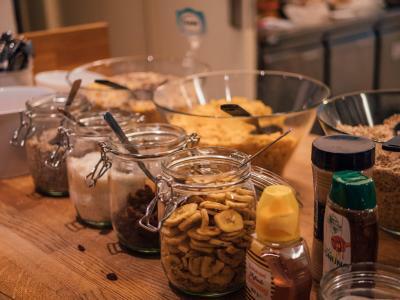 The fully equipped shared kitchen enables guests to prepare their own meals. A sauna is available on site. Guests can also enjoy a game of pool or mini golf or simply relax in the the guest lounge. Quizzes and movie nights are occasionally arranged on site. 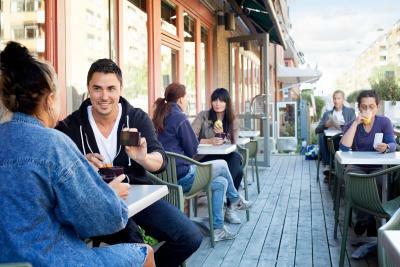 The Linnéstaden area offers a peaceful atmosphere, and has many good cafés, restaurants and boutiques. Olivedalsgatan Tram Stop is within 5-minutes walk from the hostel. Majorna-Linné is a great choice for travelers interested in convenient public transportation, museums and walking. 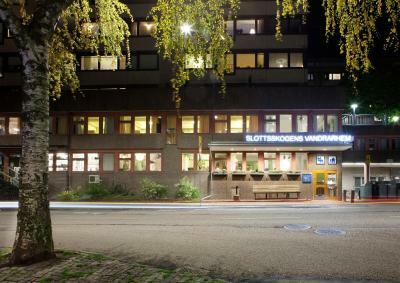 When would you like to stay at Slottsskogen Hostel? Private parking is available on site (reservation is needed) and costs SEK 75 per day. 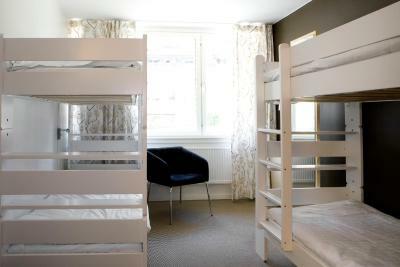 We offer a wide range of rooms and beds. From dorm beds, single-and family rooms to apartments. We hope to have something for every need and occasion. 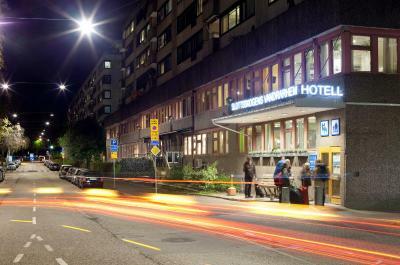 We are the only hostel that is open around the clock, every day of the year. We care about you and the environment. We are certified for our work with sustainability. 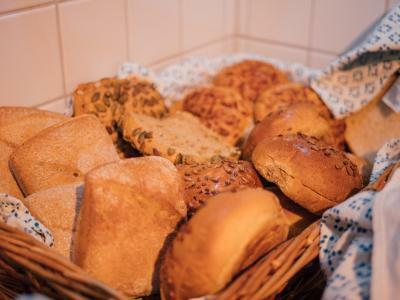 Our harty breakfast buffet is of cause fully ecological. Area Info – This neighborhood is a great choice for travelers interested in convenient public transportation, museums and walking – Check location Great location - show map Guests loved walking around the neighborhood! 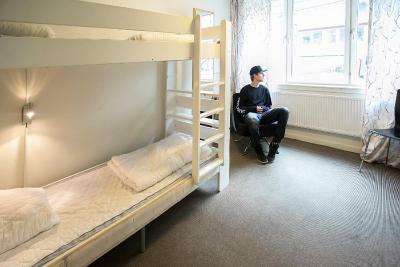 House Rules Slottsskogen Hostel takes special requests – add in the next step! Slottsskogen Hostel accepts these cards and reserves the right to temporarily hold an amount prior to arrival. Guests who arrive after 18:00 are kindly asked to contact the hotel in advance. Contact information is provided in the booking confirmation. Towels are not included. 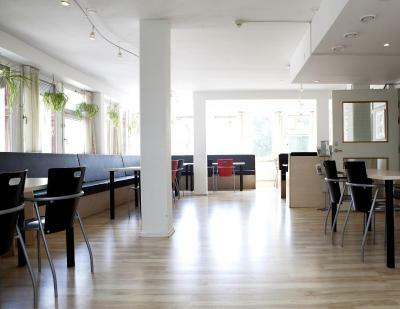 You can rent them on site for SEK 20 per person or bring your own. Please note that the hotel does not accept American Express cards for payments. Slottsskogen Hostel requires that the credit card holder’s name matches the guest’s name on the booking confirmation. Guests are required to show matching photo identification and the credit card used for booking upon check-in. The extra sms reminder about my trip (on top of booking.com's own) was really unnecessary to the point of causing some annoyance. And for those who are in a hurry upon departure, be aware that you're expected to clean your own room - or pay extra for them to do it. The bed was very soft and not comfortable. There was no way to control temperature: sometime during the night it became very stuffy. The location is not central, but the bus stop is very near and tram stops are not that far. Hair-dryer was in the room, which is very convenient. I wish single rooms were more comfortable and had a window. More qualified Staff. I liked the hostel location, it was near the center. Reception is in other building opposite of the room that is not easy to find the staff. Room card control the main power supply of the room. When I go out it is inconvient to switch on the power. Towels are extra price. You have to make bed yourself and then get it to laundry yourself. Also you have to clean the room by yourself or be charged extra. I feel like this is basic things for the hotel to be a hotel. This is not a big deal for me. Especially considering how much money i saved. I always try to leave the room as clean as i can but i was left paranoid that i might left some trash and could be charged extra for that later. Hotels are ludicrously expensive in Sweden so i was very surprised to find a single room for a price i would consider a bargain in much cheaper country like Germany. The hotel is what you expect from a hostel from this price range. Small room with a bunk bed and tv. Hair dryer was in a room which is nice. Usually you have to go and get it on the reception in hotel of this price range. Location is very good for the price. You can go to the city center in 20 minutes by foot. It is also conveniently located near 11 tram that goes to the island ferry which is main attraction. Stuff was extra nice and friendly which is surprising. Usually stuff is very moody in places like that. The waited for me even thou my plane was very late and i was checked in way after midnight. It was clean and i felt safe. What else you can expect form the place like that? Good bed and quiet place. Excellent breakfast to a reasonable price. Comfy beds and clean room, temperature of the room was great. The hostel is actually an old boarding school that has been converted ,it's pretty cool. The staff and owner is amazing Free laundry service Very huge room. The place is spotless! Not a single spec of dust. At least small towel included in price would be great, however one can rent one in reception. One of the best comfort to price ratio in Goeteborg. Teasty breakfast for reasonable price. Nice common area. Water had come out of the shower room after we took a shower, and we have already put some towels on the floor of the washing room. Very spacious family room, legoland and shopping mall are within walkinc distance. The shared bathrooms were not that clean. There were things (mold or dirt) on the wall that could not have been from previous users that day. The room was bit cramped.